In his own world, a photo by The Bacher Family on Flickr. 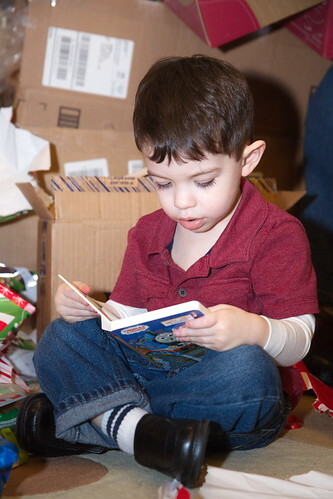 As we finished unwrapping Christmas presents, little Matthew picked up one of his new books and began to "read" quietly, immersed in his own world among the boxes and littered wrapping paper. It was such a wonderful moment, all the more so because he sat completely oblivious while I reached for my camera and fired off a few shots documenting the moment. There's nothing more magical that watching a child discover the joy of books.